In the U.S. strawberries typically peak during April in Florida and Texas, May in the deep South, and in early June in middle sections and later June in the far North and Canada. Keep in mind that crops are ready at various times of the month depending on which part of the state you are located. In order to produce good local strawberries, producers depend on ideal spring weather conditions. 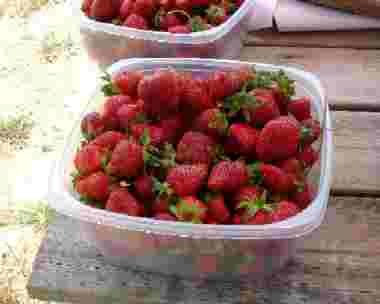 Picking the best strawberries: Select firm, fully red berries. 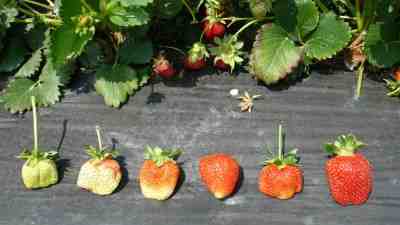 Strawberries DO NOT continue ripen after they are picked! In the photo, only the berry on the far right is completely ripe. Strawberry festivals: Most areas that grow strawberries have a strawberry festival, at which you can taste all kinds of fresh strawberry foods, pies, jams, cakes - and most commonly, fresh strawberry shortcake. To find out where and when there is one near you, see this page for a list of strawberry festivals, sorted by state! 1 quart of fresh strawberries weighs 1.25 lbs to 1.5 lbs (or 600 to 700 g). Of course, the weight varies on variety and weather conditions. 1 quart is normally enough for 4 servings, although I'll admit my son can eat 1 pint by himself! How much to pick? In general, 1 quart of fresh, whole, just-picked strawberries = approximately 3.5 cups hulled, whole berries. In other words, removing the caps/hulls and the occasional mushy berry means you lose 1/4 cup to 1/2 (it depends how much fruit you remove with the hull) or about 7 to 12% of every quart you pick. U-pick strawberries are much healthier than store-bought. Consumer reports says store bought strawberries have so many pesticide and fungicide residues on they, that they don't recommend you eat them at all! 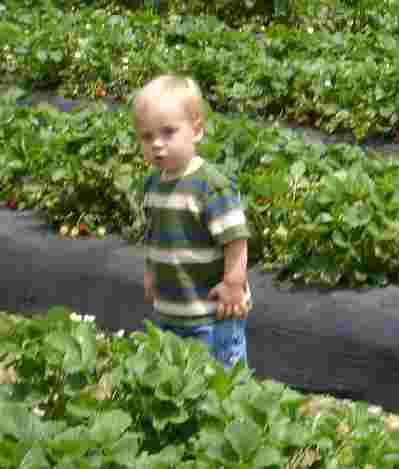 U-pick strawberry farms typically sell berries by the pound. 1 lbs of fresh strawberries is about 2/3 of a quart. 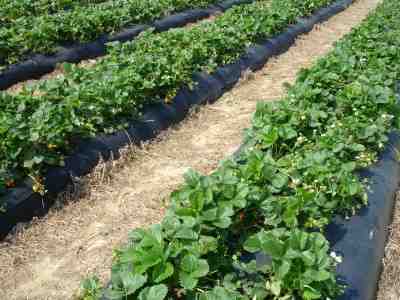 The strawberry plant adapts to wide variety of soil conditions, but does not tolerate drought well, and the berries quickly rot if the weather is rainy. For this reason, the plants are usually grown on raised beds through plastic mulch! Cultivation of strawberries began in Europe in the 1300's, but the berry only became very popular in the early 1900's in California. Do the math and be careful not to over-purchase as strawberries quickly mold when left at room temperature, and only last a couple of days in the refrigerator. Want to grow your own strawberries? 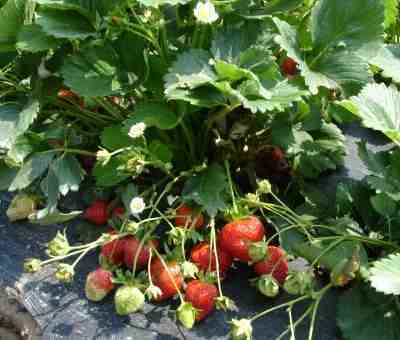 Here's an article about how to: Strawberries are an Excellent Fruit for the Home Garden, HYG-1424-98! Always call before you go to the farm - strawberries are affected by weather (both rain and cooler temperature) more than most crops. And when they are in season, a large turnout can pick a field clean before noon, so CALL first! 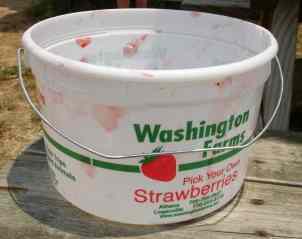 Most growers furnish picking containers designed for strawberries, but they may charge you for them; be sure to call before you go to see if you need to bring containers. If you use your own containers, remember that heaping strawberries more than 5 inches deep will bruise the lower berries. Plastic dishpans, metal oven pans with 3 inch tall sides and large pots make good containers. I like the Glad storage containers like the one at right. Avoid placing the picked berries in the sunshine any longer than necessary. It is better to put them in the shade of a tree or shed than in the car trunk or on the car seat. Cool them as soon as possible after picking. Strawberries may be kept fresh in the refrigerator for two or three, depending upon the initial quality of the berry. After a few days in storage, however, the fruit loses its bright color and fresh flavor and tends to shrivel. For interesting and fun strawberry facts and trivia from the California Strawberry Commission, click here! Put a couple of days supply into the fridge, wash and cut the caps (green tops) off the others and freeze them up! (Unless you're going to make jam right away) See this page about how to freeze strawberries. If you like the strawberries you picked, ask the farm what variety they planted, and not the weather conditions the week or two before. The flavor of a strawberry is affected by the variety, the weather and the degree of ripeness when picked. Now, get ready to make strawberry jam. It is VERY easy - especially with our free strawberry jam instructions - they're illustrated and easy. Strawberries were originally called strewberries because the fruit was 'strewn' amongst the leaves of the plant. California is king of strawberry productions because: California produces 75 percent of the nation's strawberry crops; one billion pounds of strawberries each year. If all the strawberries produced in California in one year were laid berry to berry, they would go around the world 15 times. Each acre of land in California in strawberry production produces an average of 21 tons of strawberries annually, with a total of 23,000 acres of strawberries planted in California each year.